I like them all. Trying to make the lightest color possible took me a long time to achieve. Now that I can do that I don't target anything specific. The recipes I make myself usually fall in the 8-13 range. Most the time 8 to 14. Took me as well long to fine tune my beer color. In the beginning did go for taste. Color i was not so concerned. Now i like to achive both. For a specific brew. Color and taste. Makes me proud to achive a nice beer. As you would suspect I do color by style somewhat. A Stout is really dark of course. Wheat beer light but cloudy. For IPAs I like them more on the darker (for style) side. I don't brew any Pilsners so very light is not in the equation. If the color comes out not what I wanted, an opaque glass is in order. 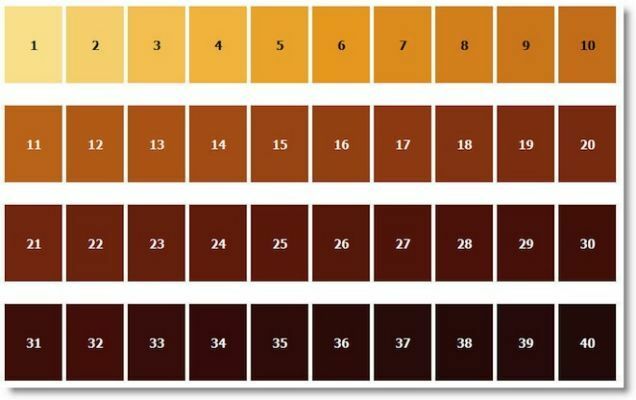 I'd say the vast majority of my beers are in the 3-5 range. Same here. Just looked at "my recipes" page on Brewer's Friend, only a few outliers, one 35! Interesting question. While my colors depend on the style I'm shooting for, I have to say that most of my favorites are in the 14-16 range. I do love a copper/reddish amber. Yep, my winter ale clocks in at 33, otherwise everything else seems to be under 6!